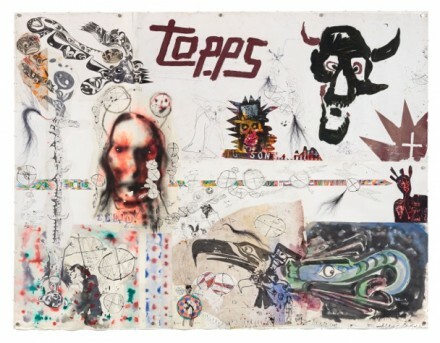 Brad Kahlhamer, The Four Hairs (2012), All images courtesy Andréhn-Schiptjenko. 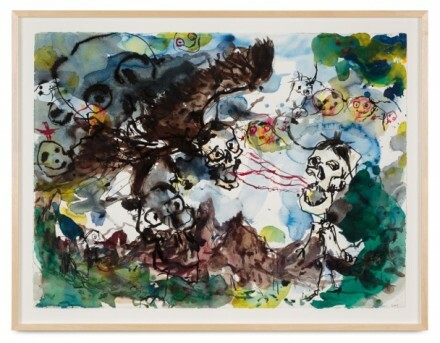 New York-based artist Brad Kahlhamer is currently on view at Stockholm’s Andréhn-Schiptjenko. The artist, who works across mediums ranging from painting and sculpture to video and music the gallery has chosen to invite viewers to access his unique understanding of his surroundings or perhaps, alternative reality, through his painting, assemblage and sculpture. Kahlhamer’s work springs from a personal place, an exploration of his own ethnic and cultural identity; he is born Native American and was adopted at a young age by a German-American family. 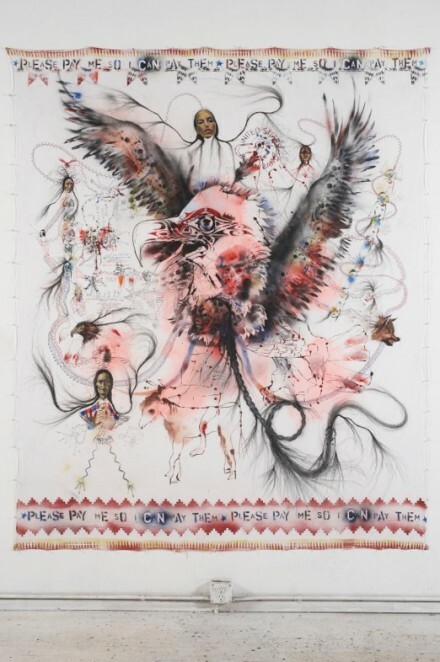 His Native American heritage permeates his practice, not only through visual aspects like colors, patterns, and symbols like headdresses but also the materiality of the work’s spiritual components, like his totem poles and models figured on Hopi and Zuni Katsina dolls. 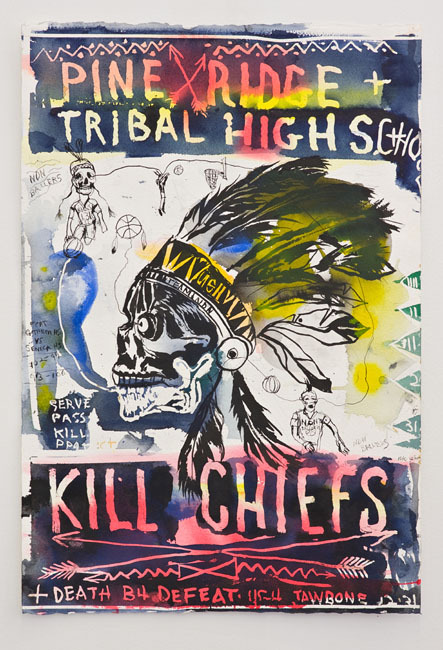 The Native American aesthetic is always juxtaposed with urban street culture and/or a distinct American aesthetic such as brand logos, landscape or wildlife, as well as pop and rock-cultural references. Kahlhamer has a professional background as an art director for Topps Company; the manufacturer of confectionaries like “Push-pop” and “Bazooka” bubblegum as well as collectible games and trading cards, and he has also created album covers for indie rock-bands The Kills and Man Man. The Four Hairs is the artist’s third solo show at Andréhn-Schiptjenko. 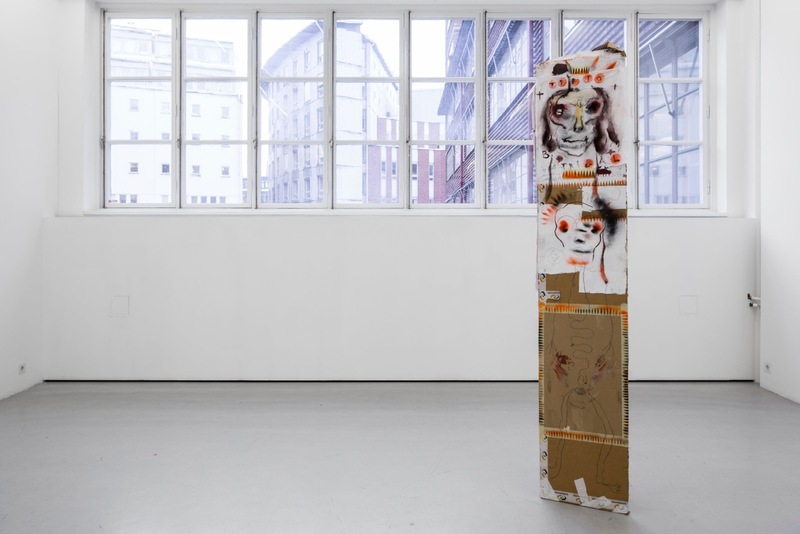 The Stockholm gallery was founded in 1991 by Ciléne Andréhn and Marina Schiptjenko today it is well established and ranks high on the international arena present at several of the leading fairs such as; Art Basel, Art Basel Hong Kong, Zona Maco and The Armory Show. The gallery has successfully launched the careers of several Scandinavians artists, including Annika von Hausswolf, Tobias Bernstrup, and Cajsa von Zeipel the latter two had work on view this year in New York at Moving Image Art Fair and at their booth in The Armory Show and, introduced internationally acclaimed artists to the Scandinavian market, Uta Baarth, José León Cerillo, Siobhán Hapaska, Nandipha Mntambo, and Tony Matelli to name a few. Kahlhamer’s studio in Bushwick is his work space, as well as a reflection of his artistry; he has a collection of taxidermy animals on display in a bookshelf and the creative process of his sculptural figures can be followed throughout the studio, his birds are at one stage placed outside the window for weathering. As in taxidermy, the character or movement of an animal is captured, so Kahlhamer’s work captures a moment or an idea, and portrays it to the observer. On view in the light flooded galleries at Andréhn-Schiptjenko are seven wall pieces on paper, one on bed sheet and a sculptural totem pole all framing the large scale mixed media wall piece The Four Hairs (2012), the core of the exhibition. Stages of authority throughout life are portrayed: adults, guardians, employers, lovers, muses, and perhaps the most difficult authority of all: the mind. The spirituality and vivacious character of the work makes it look effortless, but Kahlhamer’s use of different materials, ranging from gouache, ink, oil on paper and textiles is exquisite shifting from clear to bleeding lines and abstract to figurative forms. 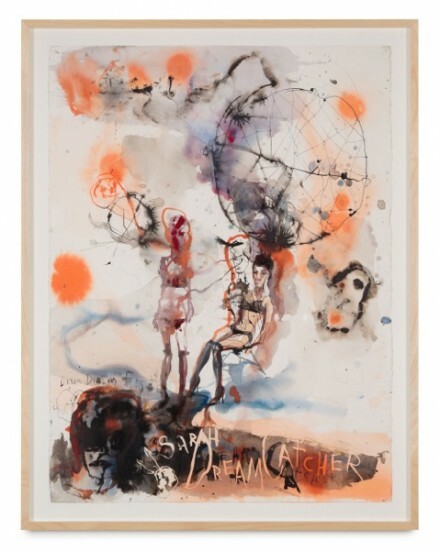 Brad Kahlhamer’s work has been collected by institutions such as the Museum of Modern Art, the Whitney Museum of American Art, the Denver Art Museum, the Milwaukee Art Museum, and the Madison Museum of Contemporary Art. He is the recipient of several prestigious awards such as Joan Mitchell Award, Smithsonian Commission and The Louis Comfort Tiffany Foundation Award. 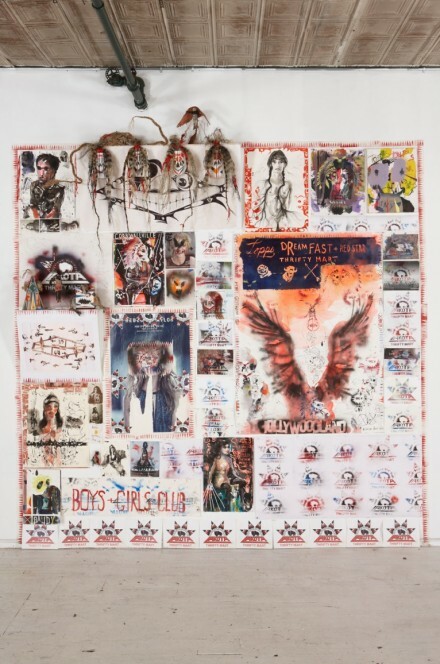 The Four Hairs is open at Andréhn-Schiptjenko, Stockholm through March 29th, 2014, and the artist’s next solo show, Fort Gotham Girls+Boys Club runs March 28th- April 26th, 2014 at Jack Shainman Gallery, New York. This entry was posted on Thursday, March 27th, 2014 at 12:00 am	and is filed under Art News. You can follow any responses to this entry through the RSS 2.0 feed. You can leave a response, or trackback from your own site.